by Jim Dorney: I used to write fairly regularly for this site, prior to the birth of my children. Since then, I’ve still kept up with boxing but haven’t found the time to write about it. However – I’ve observed some negativity and xenophobia on this site of late which compelled me to make a writing comeback of sorts. Hopefully (assuming it’s published) this article might present a balanced perspective into the division and one of the fighters who often tends to be the subject of the articles and forum debates that tends to veer off into trash-talking – Deontay Wilder. The objective of this article is to provide an honest and objective appraisal of Wilder and the state of the heavyweights, based on stats and my thoughts. If I succeed in this alone then it will have been worthwhile. Firstly – I’d like to say that I think it’s a good thing that we have two recently crowned heavyweight champions – Wilder, and of course Tyson Fury. I think it’s a good thing for the division to have some new blood at the top, and this, a transatlantic rivalry plus several challengers and up-and-comers makes for a potentially very exciting next few years in the division. Another benefit is the potential opportunity for an undisputed champion, with two young and fresh champions keen to unify the division – more on that later. Wilder is a relative latecomer to the sport, and to his credit, in spite of that has an impressive amateur heritage which he compiled rapidly prior to turning pro, the principal achievement being a bronze medal in the 2008 Olympics (the only boxing medal the US won that time around). Since turning pro in late 2008, Wilder has amassed a 35-0 (34) record, his winning fight for the WBC championship against Germane Stiverne being the only one to go the distance thus far. In doing so, Wilder has demonstrated many positive attributes including natural athleticism, concussive power particularly with the right, but also with the left, speed and aggression. He has charisma, and the US are clearly delighted to have an American born and bred heavyweight champion again after several years of European dominance. Perhaps the biggest criticism levelled at Wilder is the level of opposition he’s fought, both before and after fighting for the championship. Let’s explore that a little more. I have some sympathy with Deontay here, in that he can only fight who’s in front of him, and he likely has little direct control over who he’s fought – certainly early on in his career. The same was said about one of my all-time favourite fighters, Joe Calzaghe. Indeed, when Calzaghe finally stepped up and fought Jeff Lacy, many fans (particularly those in the US) derided him as a paper champion and gave him little chance. Calzaghe proved them wrong, in spectacular fashion, and went on to beat several other great fighters, including Mikkel Kessler and Bernard Hopkins before retiring with a perfect 46-0 record. Whether Deontay will follow the same path to greatness remains to be seen. The last on this list (Kelvin Price) is an interesting case in point. Undefeated at 13-0, and standing 6’7 with a reach of 82.5 and weighing 244 lbs, he’s one of the few fighters Wilder has fought that can compete with him in size (the other one being Firtha). In Price’s case, he actually did fairly well over the first two rounds, before being overpowered and knocked out in the third. The reason I don’t rate Price higher than a tier two fighter is because with only 6 KOs in his record he arguably didn’t represent a genuine threat of being able to stop Wilder. In fact – about the only fighter Wilder’s yet fought who did represent that threat was Stiverne. So – onto the championship fight. Stiverne was making the first defence of the WBC title which he won against Chris Arreola whilst the title was vacant. Stiverne had proved a strong fighter with a good punch, albeit perhaps not the quickest. The win-loss record of his opponents stands at 399 wins vs 211 losses. Not the most impressive resume for a champion, as we’ll come back to later. Prior to the fight I didn’t know which way I thought it would go. I doubted it would go the distance, and suspected either fighter could stop the other. What I didn’t really expect was for Wilder to dominate from a distance as he did. Whilst some may say Stiverne looked poor, in my view Wilder made him look bad by playing to his strengths, much as the same can be said about Tyson Fury against Wladimir Klitschko this weekend gone. Granted, it wasn’t pretty or the most exciting fight I’ve seen, but Fury simply nullified Klitschko’s offence, enabling him to appear to all attempts and purposes to coast to a surprisingly easy victory. The scorecards for the Wilder vs Stiverne fight seemed generally fair to me at 118-109, 119-108. I think Craig Metcalfe’s 120-107 was a bit much, as I thought Stiverne pretty clearly won a couple of rounds. So – the championship had changed hands, and whilst Wilder’s consecutive knockout streak came to an end, the price was well worth paying. Whilst a new champion is entitled to at least one voluntary defence, I’m afraid I (along with most boxing fans) just don’t rate either Eric Molina or Johann Duhaupas as quality title challengers. That said, Molina had his moments against Wilder (which came as a surprise), and Duhaupas certainly was tough. Did anyone honestly expect weather to beat Wilder though? I don’t think so. One positive for Deontay is that both gave him a decent go of it, and provided him with valuable rounds and experience. That said, I believe an argument could be made that Wilder is one of the lesser experienced heavyweight champions of recent times, and that is largely a consequence of being so carefully managed as outlined earlier. Whether this will prove to be an error or not remains to be seen. To come back to the numbers game, the win-loss record of Wilder’s opposition to date stands at 530 wins vs. 217 losses. This is relatively more impressive than 399 wins vs 211 losses for Stiverne, who it could also be said was one of the more inexperienced of recent champions. Compare these numbers to Wladimir Klitschko’s opposition record, which stands at a most impressive 1,612 wins vs. 348 losses. Notwithstanding the fact that Klitschko has had many more fights than both Wilder and Stiverne (hence the greater experience), that takes nothing away from the enormity of Tyson Fury’s recent win against Klitschko. At the point Fury fought him, Klitschko had been champion for nearly 11 years, won 25 title fights, including 18 consecutive – this versus Wilder being Stiverne’s first defence. Another fighter who has tended to be mentioned in the same sentences as Wilder and Fury of late is Anthony Joshua. Here’s where I feel there’s hypocrisy amongst some writers and forum participants who are deriding Joshua, given Anthony has only had 14 bouts, and has moved along way faster than Wilder did. In his 15th fight, Joshua is due to face the undefeated 16-0 (13 KOs) Dillian Whyte, who beat him in the amateurs, and presents a genuine threat. By his 15th fight, Wilder was fighting 15-6 DeAndrey Aubron. Who? Quite. Shall we give Deontay some rope and see who he was fighting by bout number 20? 11-1 David Long, who lost to Mike Miller who was 4-12 at the time. Fight 25? Undefeated (14-0) Damon McCreary. OK – McCreary was undefeated, but overweight and short (5’11 and 262.5 lbs) and is now 15-5. Again, in case you think I’m being harsh I feel if there’s any blame for being managed so carefully and moved on so slowly, it lies with Deontay’s management and not the man himself – it just irks me when I read criticisms of Joshua whose current opponent win-loss record stands at 304 wins vs 127 losses, which if you compare with Wilder’s at the same point in his career (97 wins vs. 105 losses) looks very impressive. Now – As mentioned at the start of this article, whilst I have great respect for what both Klitschko brothers (particularly Wladimir) achieved, I’m of the view that fresh blood an a changing of the guard is a great thing for the heavyweight division. I like a bit of continental rivalry as much as the next guy, and the stage could be set for some great fights over the next few years. I doubt we’ll see the same long-standing dominance over the titles that we had for so many years with the Klitschko brothers. Tyson Fury reckons his cousin Hughie could join him as world champion in a Klitschko-style family dynasty, but presently Hughie is still a work in progress, albeit one with potential. Wilder has recently stated since Fury’s victory over Klitschko that he’s the best heavyweight on the planet. I don’t dispute that potentially he could prove this to be true, but as things stand I don’t agree with that assertion. As I’ve outlined above, I don’t believe Wilder has beaten sufficient top-level fighters to warrant calling himself the best out there. Klitschko was clearly the best out there by a country mile, so I guess a case could be made for Fury, but I feel both Wilder and Fury could make a compelling case over the next few years dependent on how they both get on. I understand Wilder is likely due to face Vyacheslav ‘Czar’ Glazkov next. I would expect him to probably win that fight, but I doubt it will be a blowout. Glazkov can punch, has stamina, and is well-schooled. I felt he was lucky to get a draw against Malik Scott, and that Scott did enough to win in my eyes, but otherwise he has a decent record, including wins against decent fighters such as Tomasz Adamek, Steve Cunningham (albeit another controversial decision) and Derric Rossy. Assuming he gets past Glazkov, Wilder is due to face a mandatory challenge from Alexander Povetkin. I feel this will be a real test for Wilder. Povetkin has looked good against everyone he’s fought bar Klitschko, and I think he may well give Wilder fits. Concerning the champion holding the rest of the belts, Fury will likely face Wladimir Klitschko in a rematch, assuming Klitschko wants it. That will be a massive fight with huge interest, and one that Fury will have to pull out the stops to win, showing all his boxing IQ and natural talents. If he gets past that then several intriguing match-ups could be made, including a unification fight with Wilder. I for one hope it happens, and I wouldn’t like to bet either way if it does. The experience of the preceding fights for both would dictate the favourite for me. Presently I feel Wilder, whilst 6’7 lacks weight for the likes of Fury, but he’s gradually growing into his frame, and come the point where they are matched in the ring they may be more parity than there is presently in that department. Considerable (9/10) – Deontay can bang – there’s no doubt about it. The stats don’t lie, and I dear say he may well be the biggest single-punch fighter in the division right now, although I think David Haye now he’s back could give him a run for his money here. He’s proven lethal with the right particularly but also highly dangerous with the left. Not only does he punch like a mule, he has fast hands for a heavyweight too – a dangerous combination (if you’ll pardon the pun). Strong (7.5/10) – Wilder is 6’7, with an 83’ reach. The reason I haven’t marked him higher is that he’s relatively light for the weight. He start out around 210, and hasn’t topped 230 yet, which is a little surprising given his frame. He may need some extra weight to be able to defeat the likes of Fury or Klitschko, as good fighters like Herbie Hide have done well at heavyweight, but when fighting the likes of Roddick Bowe who outweighed him by more than a stone were simply overpowered. The only fighter I can think of who could compete (at his best) with the best of them who’s under 230 lbs is David Haye. 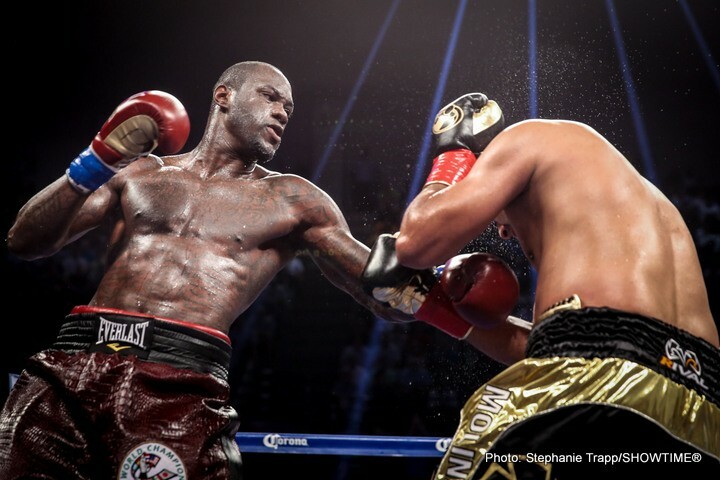 Strong (8/10) – Wilder is athletic and proved way too fast for Stiverne. However – we’re yet to see him against an equally big man who can also move well – the likes of Fury or Klitschko. He could pass that test, but until that point I don’t think he can score higher than 8/10 presently. Average (5.5/10) – I realise this might get some people’s backs up, but I think I’m being fair here. For his run up to the championship he had a very smooth ride of things, and since then, he’s not chosen to go up against anyone who had a realistic chance of beating him. He appeared to want nothing of Klitschko, and calls out even less-experienced fighters like Hughie Fury and Anthony Joshua. As with stamina, until he’s been in some close matches and is willing to test himself against the best, how he will react in a life or death struggle is an open question. Largely unproven (6/10) – As with experience, I don’t think this has yet been truly qualified. He went the distance against Stiverne but was controlling the pace. He went 11 rounds with Duhaupas, but was again in control of the action. Wilder is yet to have to go the distance against an equal who can get him out of his comfort zone and take him to the trenches. He may pass the test once that day comes, but the fact that he’s been so carefully managed to this point begs questions about his stamina, punch endurance or both. Largely unproven (6/10). With the exception of Stiverne, I don’t see that Wilder’s fought any dangerous punchers. Rumour has it that David Haye gave him a going over in sparring, and Haye has inhuman power for a relatively small heavyweight. Again – perhaps he’ll pass the test of a big puncher who lands some clean blows with flying colours, but until that point, who knows? Everyone can be beaten of course. Fury has shown his vulnerabilities being knocked down by Neven Pajkic (which looked like an off-balance flash knockdown), and more seriously so against ex-cruiserweight champion Steve Cunningham. That’s got to raise some concerns, but styles make fights, which is why whilst Wladimir Klitschko in theory should have murdered Fury ended up instead being unable to solve the puzzle he presented. Wilder is presently undefeated, which no-one can take away from him. I’m not suggesting that the fighters in the list above would destroy him or beat him ten time out of ten by any stretch – I’m suggesting that based on their relative strengths and the question marks I presently see concerning Wilder that each of them would stand a decent chance of victory. Who knows many of these fights will come to pass, and what the result will be be, but I think they’d be great to watch! In conclusion, I feel the next few years are potentially going to be very exciting for boxing’s flagship weight class. Deontay Wilder may well play a significant part in that – We’ll just have to found out how significant. I’m not suggesting he’s no good for a moment, but that he’s relatively inexperienced given he’s an incumbent heavyweight champion. Hopefully the numbers take the subjectivity out of that. I suppose the thrust of my argument here is that he’s yet to show how good he really is, and time will tell.